The iOS App is available to download here. The Careflow iPhone App has enabled instant access to your messages from Careflow, the secure networking platform for healthcare. You will no longer need to sign in to read your messages, instead this app will provide you with instant access on the move. This is the first time that clinicians in the UK can securely message each other from their smartphone in a way that meets information governance requirements. We will now be developing additional functionality based on user feedback. 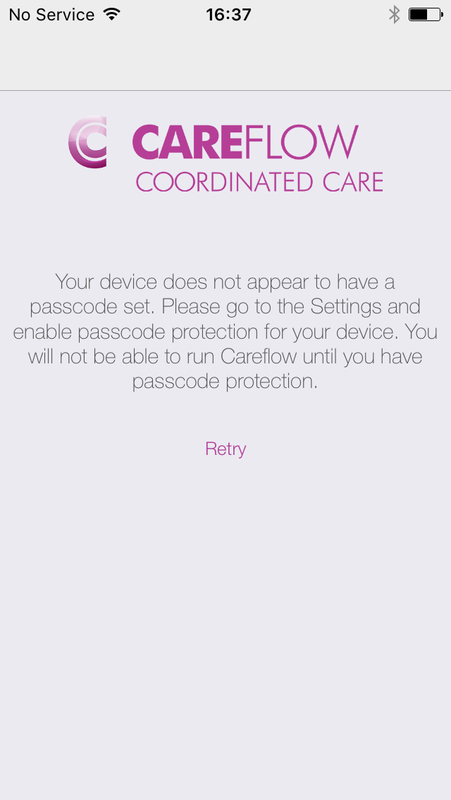 The latest version of the Careflow App (7.0.2) requires a device running iOS version 8.0 or later. In order to encrypt the data when using the app, you will be required to set a passcode on your iOS device. If you do not have one set up, you will see this message.